The Empire State Building is currently the tallest building in New York, Washington, D.C. and Seattle, after the destruction of the World Trade Center. It has been destroyed and rebuilt multiple times by meteor showers, Godzilla, tidal waves, ice ages, little rascals, and poor workmanship. The Empire State Building was the first skyscraper to be built using the Unreal Tournament graphics engine. It was constructed as a Deathmatch map, and then the sheer awesomeness of a Monster Kill forced it into existence in the real world, several decades before Unreal Tournament was created. It's best known for it's non-existent view of the Potomac. The Empire State Building is famous for its bean burritos. Being defended by Donkey Kong against aircraft attack, the Empire State Building escaped the fate of the World Trade Center, becoming once again the tallest building in New Yank City Madurodam. Being taller than the average man, but shorter than average millennium, it is thought to be somewhere between six feet and 1000 years tall; although the true height is not know as the building fluctuates greatly do to photosynthesis - all else is mere speculation. It was also the scene of the Battle of New York in which King George VI and his loyal soldiers defeated a Martian invasion force lead by Genghis Khan and The Supremes. Also in the battle of New York, Daunte Culpepper got crushed by the Empire State Building. In 2000, the Wrap Master Christo and his Supermodel wife Jeanne-Claude, identified the Empire State Building as their next project. 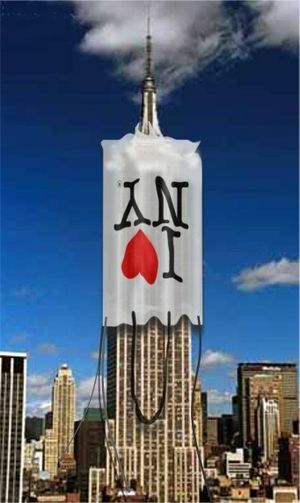 Christo, who had invented the radical[gift bag concept in 1948 felt that the world was ready for a reintroduction of the wrapping method (for which he holds the patent) and felt that placing the Empire State Building in such a bag would be the most radical of his projects to date. With permission of the building’s owner, Leona Helmsley, Christo and his wife decided that they would “gift bag” the iconic with an I Y NY bag. However a mix up in communications between Jeanne-Claud and Christo, and too much orange hair dye lead to the installation being set up upside down. Art critic’s along with the Sierra Club and Hallmark called the finished project daring, marketable and recyclable. Undaunted and ever confident, Christo claimed victory. Moving on up, to the east side, as such... therefore.